The Georgian Triangle host some of the best running routes & trails in the province and has attracted many liked minded running athletes to the area to train or just enjoy the scenery. 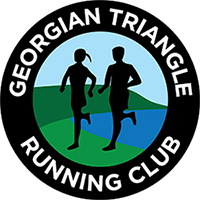 The Georgian Triangle Running Club (GTRC) aims to unite these individuals though a common passion of running as well as align their interests to further the development of running-based initiatives in the area. A runner may run completely alone and miss out on the experience & knowledge available out there to have a long, successful career (even if recreational) as a runner. In no way do we mean to change whether you run, solo or with a group, there are benefits to both. Many of us in the club enjoy our time running by ourselves and letting the stresses of the day go, but this does not mean that you have to be disconnected from the running community! And so began the GTRC. We’ve worked hard and thought long about what we, as runners, would want out of a great running club. To us – the club should bring runners together, be a comprehensive resource for runners of all abilities and inclinations, and it should help to build and nurture the spirit of running we all love so much… and it should be fun! We think membership with the GTRC brings all that. The Collingwood Half Marathon is a scenic 21.1 kilometre race run in the heart of the Georgian Triangle. The route begins at Fisher Field in Collingwood and runs down 6th street and across the main street of Collingwood. After turning towards the east end of town and running east on Ontario Street, the race heads for open countryside via Raglan st., Ron Emo Road, Sanford Fleming Blvd and 6th line. After a turn to the west on Poplar Side Road runners are presented with a spectacular view of the Niagara Escarpment in the distance as the run makes it’s way from km 9 to km 14. At the 14th kilometer the only short gentle uphill of the race passes and at km 16, runners turn north to follow the base of the ski hills with very gentle rolling pavement that begins to descend at km 17. At km 18 after a long downhill, the race turns east again towards a finish at Fisher Field, a segment that is downhill. In the Collingwood Half you get the best of the historic town of Collingwood and the open countryside surrounding the town. The autumn colours and crisp fresh air will propel you quickly on this fast mostly downhill course. The course will be surveyed and accredited.